There were a few whistles when Adria announced this as an all-new model for 2016 – especially as it’s one of just two models that will be dubbed Silver Collection (the other being the existing Isonzo from the next range up the portfolio, Adora). 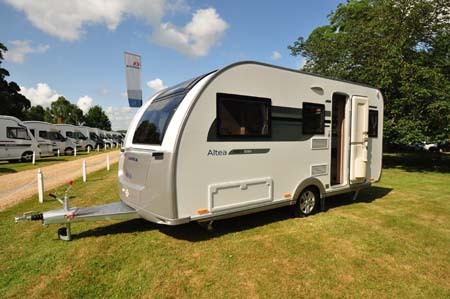 Isonzo may have been Adria’s single best selling model this year, but this Altea Eden is poised to push it close this time around. The launch model was plated at 1500kg. However, with a mass in running order of 1,220kg we’d expect that maximum to come down to around 1400kg – which still leaves 180kg of payload. More importantly, it brings the Eden within reach of many a typical family estate car. No white box this, it’s quite a distinguished look thanks to a smaller front window than we’re used to, although that’s offset by the opening sunroof. And of course, there’s quite a lot of silver here, extending round to the lower back panelling and finished off by some smart alloy wheels. There’s practicality, too, for example you can stand on the drawbar (for cleaning purposes etc) and the only bug bear is the disproportionately recessed front corner steadies. For a modern enough exterior, the interior is an intriguing mix of traditional and modern. Traditional, because the layout is a popular family floorplan of yesteryear – putting the beds at either ends allows a modicum of privacy that shouldn’t be under-estimated. There’s also a nod to the past with the flat furniture, although admittedly its treatment is such it looks anything but dated. 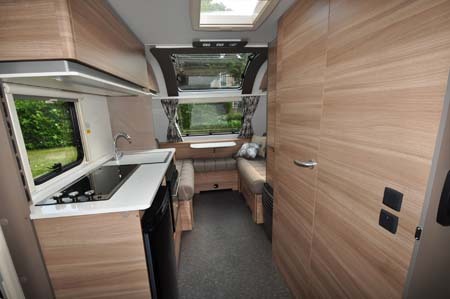 The overall interior look is decidedly avant-garde, thanks initially to a stylised woodgrain furniture finish (only the Truma fire is at odds with the contemporary surroundings). 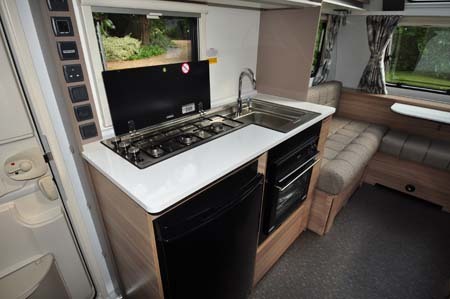 Take the kitchen, with its three-in-a-line gas hob and rectangular sink combination, complemented by a swan nick, metal mixer tap and loose chopping board/sink cover. It really optimises the available worktop. Under the counter are a Duplex oven/grill (another space-saver) and 96-litre fridge – both courtesy of Thetford – whilst overhead is a fitted microwave. If you think all this doesn’t leave a lot of storage space, you’re right. Space is somewhat at a premium in the washroom, too, despite a neat flip-down basin arrangement – it looks shallow but it seems to do the job. The bench toilet below will prove more hygienic than a swivel-bowl version – it’s just so much easier to clean around (arguably a more important point if there are children on board). There’s a curtain to pull across for showering, but the wheel arch impinges into the footspace here. 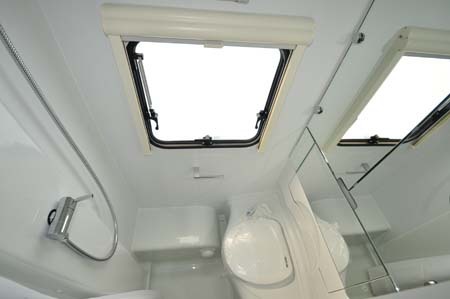 The window will prove a boon for ventilation and speeding up the drying, and the fixed hanging rail is a definite plus. Much of the above can be forgiven by the priority that’s given to lounge space, front and back. At the front, Adria eschews the usual central chest of drawers, opting instead for U-shaped seating with a tiny flip-up tabletop for occasional use. A full-size free-standing table has its own dedicated locker, easy to hand. At the back – surely an area that children will soon claim as their own – there’s a day time doubled dinette arrangement, with a TV holder close to hand as well as a useful nest of two soft-close drawers plus floor locker. There’s a drawer sandwiched between the wardrobe and the aforementioned Truma fire, which will have the added bonus that any clothing in here will feel a bit of warmth come its way when the heater is in use. Surely mum and dad will make that front lounge theirs at night, too, where converting to a double bed is easy enough. The rear seating makes a double, too, that also involves the table. There’s a bit more fiddling for the fifth berth – the bunk structure here again very much a traditional family caravan feature, but effective nonetheless. 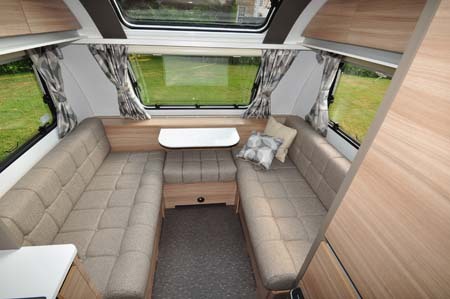 It’s up to the Silver Collection upgrades to add some flourishes – ambient lighting, extra cushions, floor carpeting door flyscreen etc – completing what looks a very promising family proposal for the season ahead. 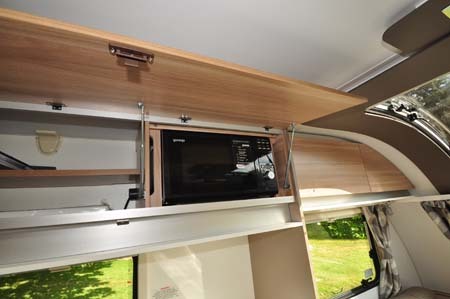 In-a-nutshell: Five go caravanning – in style! There’s more information about Adria on their website (www.adria.co.uk) and to find out more about our low-cost premiums visit the caravan insurance discounts page. The comment, “only the Truma fire is at odds with the contemporary surroundings”, may be correct, but in my experience – this product is the finest system available. It is far more reliable than the over-complicated underfloor systems such as Whale, which require constant electricity (and noise!) to blow the warmed air into the caravan – even on gas fuel. 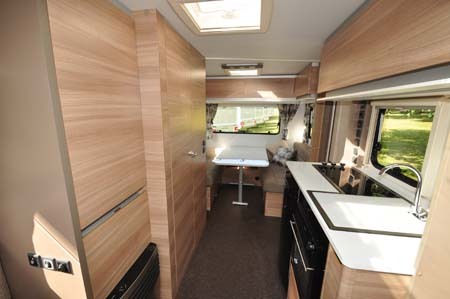 I chose my Adria purely because I wanted a heater that I knew to be both simple and reliable and completely independent of electricity if needed – as I do! ps. 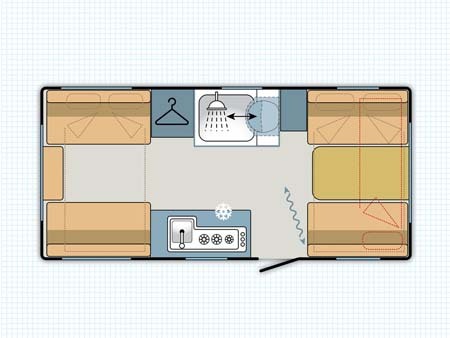 although the Truma heater was the major consideration, I have been totally impressed with the Adria Caravan for three seasons now… Kind regards, John. Thanks for your excellent comment John. 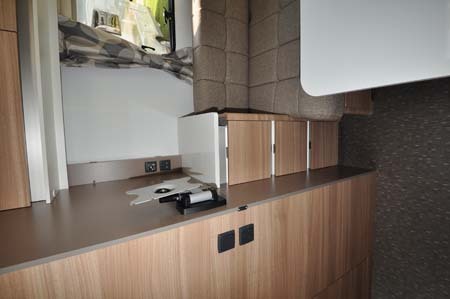 It’s great to hear you are happy with your Adria. That’s also a ringing endorsement for the Truma Fire, sometimes the simple stuff works best! do not care for the front window,not liking the bank of doors down one side storage limited over all not for me.